to help them develop the “Juice Plus+ Habit” – only that way will they see the results they deserve and that we want. 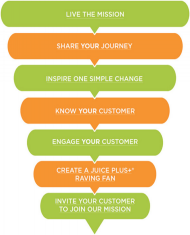 to convert them into Raving Fan Customers, who will expand the use of Juice Plus+ in their family and either recommend it to others or join our mission. Here are some ways to achieve that. Check in at Day 10, 30, 60, 90 etc. Use the One Simple Change Tracker to stay accountable. ~ Day 45 – Why are antioxidants important? ~ Day 75 – What’s so special about my immune system? 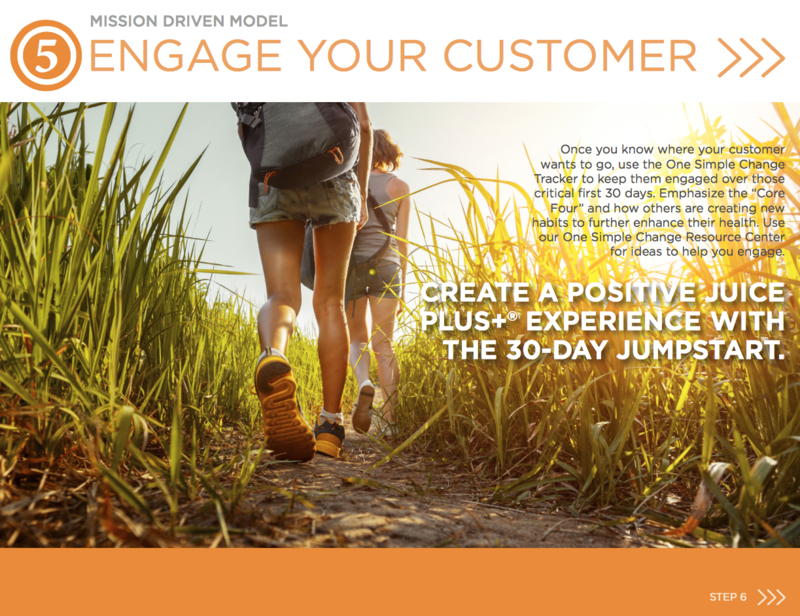 The 100 Day “Personal Touch” Customer Care Plan helps you keep track of each and every one of your customers during the critical evaluation period of their first 100 days. Your goal is to provide 10 follow-up connections with your new customer in the first 100 days – approximately once every two weeks. Juice Plus+ will send you e-mail reminders to call your customers, along with suggested talking points. In addition, you’ll receive an alert via your Virtual Office Home Page before the second box of Juice Plus+ is shipped – the perfect time to call your customer and conduct the Juice Plus+ Experience Survey. Education both before and after someone becomes a Juice Plus+ customer is important – really important. In addition to their own results it’s the best way to establish the Value of Juice Plus+. Some people want Juice Plus+ immediately; they are so excited! These people need education, so their initial enthusiasm doesn’t wane. Some people are skeptical, but once educated they believe in the value of Juice Plus+ and should soon become Raving Fans. The third group don’t get it and are not ready to be educated, so don’t waste time and energy on them. Provide on-going education to customers regarding the benefits of eating fruits and vegetables and taking Juice Plus+. Share more CDs, DVDs and online videos. Invite them to Wellness Presentations, Prevention Plus+ Seminars and other Events (pick them up to make sure they come), send regular emails with articles on health, nutrition and Juice Plus+ news (your customer will receive Juice Plus+’s 7 emails during their first 100 days). Add them to your (or your team’s) secret Facebook Group, where they will be informed and encouraged. Sending them emails with health articles is also an easy way to educate them and keep them thinking about Juice Plus+. Here are some Health Articles you can use. Once you have developed a great relationship and your customers are having a good experience with Juice Plus+, many will start giving you referrals; this may be as soon as when you conduct the Juice Plus+ Experience Survey after their first 3 months. Talk to them about our “Friends & Family” way to offset the cost of their Juice Plus+, about the full business opportunity, or being a ‘referral partner’ (you sharing the profit from new customers with them as a ‘thank-you’).